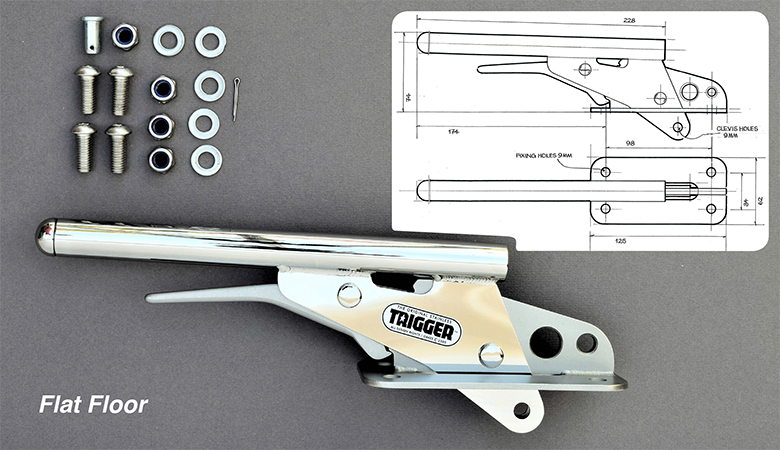 This Trigger handbrake has been designed to be mounted through a flat surface, either the flat top or a centre tunnel or the floor where there is no tunnel or stiffener. When installed it has a very low profile and is easy to fit with its combined base and finisher. A perfect replacement for a conventional handbrake in a Cobra or Seven-type roadster as well as some Hotrod and custom applications. It is also factory-fitted at Lister Bell. Includes: stainless fixings as pictured. Weight: 730gms. click here to place your order on line.